Rome From Republic to Empire - HISTORY'S HISTORIESYou are history. We are the future. After Julius Caesar was assassinated in 44 BCE, civil war broke out in Rome. Generals who were loyal to Caesar won the civil war. Those generals were Octavian, Antony, and Lepidus. Octavian was Caesar’s 18-year-old grandnephew. Caesar had adopted him after the death of Octavian’s mother and named him as his legal heir. Antony and Lepidus had been Caesar’s best generals. Agreeing to share power after their victory, the three formed the Second Triumvirate in 43 BCE. The Second Triumvirate did not last long, however. Lepidus retired from politics and Antony fell in love with the Egyptian queen, Cleopatra. Antony and Cleopatra formed an alliance, leading Octavian to think that they wanted to take over Rome. Many Romans were upset by this news. Octavian declared war on Antony. In 31 BCE the navies of Antony and Cleopatra fought those of Octavian at the Battle of Actium. Octavian’s forces crushed the couple's army and navy. After their defeat, Antony and Cleopatra killed themselves, leaving Octavian as Rome's only ruler. What did Octavian do to restore peace and order to Rome? In 29 BCE Octavian returned to Rome in triumph. After a period of transition from a state of war to peace, Octavian formally announced the restoration of the republican constitution at a meeting of the Senate in 27 BCE. While the action won him great acclaim, as did his offer to surrender his power to the Senate, everyone knew that the ancient Republic was beyond repair and that a strong government under a powerful ruler was essential to prevent a return to the chaos that had almost destroyed Rome. Octavian took his uncle’s name, Caesar. After he restored the republican constitution he was given the title “Augustus,” which means “respected” and “impressive.” In Latin, “Caesar” means “leader.” Henceforth, Octavian was known as Caesar Augustus, or “respected and impressive leader.” Octavian pretended to rule as a republican official by sharing his power with the Senate. In reality, he was an absolute monarch. From 27 BCE to 14 CE, Caesar Augustus ruled as Rome's first emperor. This first Roman Emperor proved to be an effective leader and a farsighted statesman. Augustus is considered to be one of Rome’s greatest emperors. He demonstrated remarkable administrative ability. He made sure the lands throughout the empire were well run and taxes were fair. During his time in power, he built massive roads and bridges, government buildings, and huge public baths. He said, “I found Rome a city of clay. I left Rome a city of marble.” Concentrating on internal problems, he created a standing army in Rome, as well as a fire department. In essence, he restored peace and order to Rome. Under the rule of Caesar Augustus, things got better for most people. When a distant town became part of the empire, it became a Roman town. Roads increased trade. Public buildings such as baths, arenas, and theaters gave people places to gather and to feel like they were a part of a larger community. Because of this, even people who were conquered by the Romans became loyal to Rome and embraced the idea of being ruled from Rome. Rules and institutions Augustus put in place led to a time that would be known as the Pax Romana, or “Roman peace.” The Pax Romana is a two-hundred-year period during which ancient Rome reached its peak of political power, economic prosperity, and artistic creativity. Before his death in 14 CE, Augustus had his numerous accomplishments inscribed in bronze. Historians don't agree when the Roman Empire ended. Some say it lasted from 27 BCE to 476 CE, which is when the city of Rome fell to a rebel leader named Odoacer. Others argue, however, that the Roman Empire lasted until the fall of the Byzantine Empire in the 15th century. What historians do agree on is that the Roman Empire was one of the most influential empires that ever existed. At its height, it encompassed huge areas in Europe, Asia, North Africa, and all of the islands in the Mediterranean. Even today, you can see the legacy of the Roman Empire by simply looking at the languages that so many people speak. Italian, Spanish, French, Portuguese, and Romanian all come from Latin, which was the original language of the Romans. Why are Nerva, Trajan, Hadrian, Antonius Pius, and Marcus Aurelius called the "Five Good Emperors?" The Roman Empire had many emperors. Some of them are very famous. Some accomplished great things. And, some were tyrants who are only known because of the destruction they caused. Between 96 and 180 CE, Rome was ruled by what historians call the Five Good Emperors. The Five Good Emperors were Nerva, Trajan, Hadrian, Atoninus Pius, and Marcus Aurelius. They all ruled during the Pax Romana and are considered to have led with wisdom and honesty. During their reign, they increased public services, supported the arts, and improved relations with the Roman Senate. The empire was biggest in size when Trajan ruled. By the 2nd century CE, the Roman Empire was one of the largest empires in history. At that time, it spread across all the lands that touched the Mediterranean. 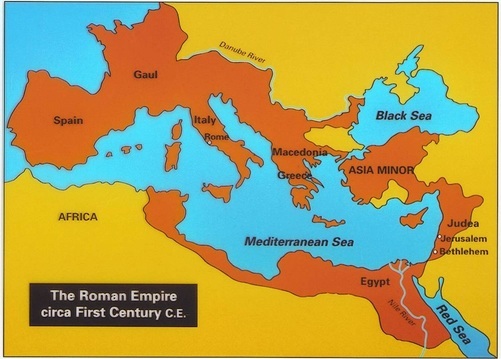 The empire also included Gaul and Britain in the north and Mesopotamia in the east. It was so large that one in every four people on earth lived and died under Roman law. Agriculture was the most important part of the empire’s economy. Some cities became centers for making pottery, cloth, and brass. Traders came from all over the world to drop anchor at ports in Italy. They brought silk from China, spices from India, tin from Britain, lead from Spain, and iron from Gaul. 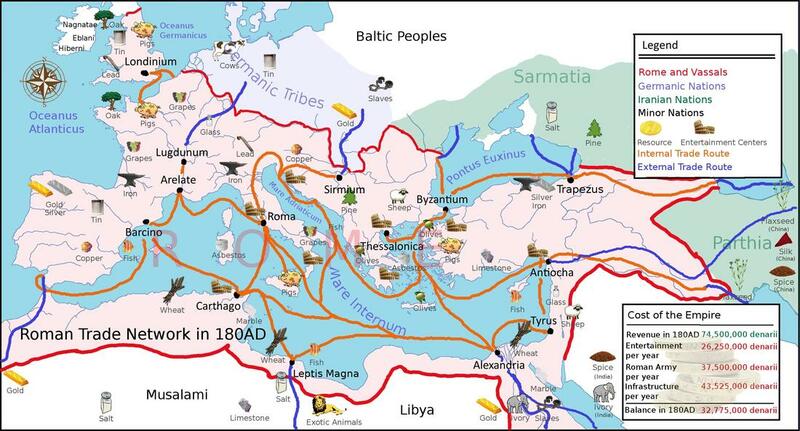 ​The Roman Empire had a good system of paved roads that helped trade grow. The Roman navy kept trade routes safe across the Mediterranean Sea. That made it safer for ships to bring goods in and out of the empire’s ports. To make trading across the empire easier, by the second century, everyone in the empire used a common currency, or money. 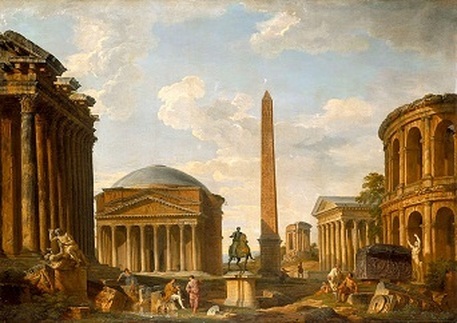 That meant that a merchant in Greece could sell to a person in Italy, Egypt, Spain, Anatolia (Turkey), or Mesopotamia. People also used a common system of weights and measures to set prices, trade, and ship goods. Many people became wealthy. However, most people in the cities and on the farms were still poor. Many other people were still enslaved. The empire was united because people thought of themselves as Romans. Even if they spoke different languages, they had the same laws, rulers, and culture. The empire's immensity, however, made it too big to rule well. As a result, many rulers after Trajan pulled troops out of areas that they could not defend well. For example, in order to strengthen the empire's boundaries at the Rhine and the Danube Rivers, Hadrian pulled troops out of Mesopotamia. Not all Roman Emperors were as good. Rome had its share of ineffective leaders who acted like tyrants. One of these tyrants was named Caligula. Modern historians think that Caligula may have suffered from a mental illness. He is said to have put to death both his friends and his enemies. Even during his own life he was famous for being cruel. He proposed making his horse, Incitatus, a priest, as well as the head of the government. Once, he made an attempt to invade Britain, but instead declared war on the English Channel and ordered his soldiers to gather sea shells from the beach. Perhaps unsurprisingly, Caligula was murdered by his bodyguards in 41 CE. Probably one of the most infamous Roman Emperors was Nero. He ruled from 54 to 68 CE. Nero is accused of murdering his step-brother, his mother, and his wife. His leadership was so erratic that eventually he was declared an enemy of the state. Upon hearing that news, Nero committed suicide. Nerva, Trajan, Hadrian, Antoninus Pius & Marcus Aurielus were Rome's Five Good Emperors. Together, their rule lasted from 96 - 180 CE. The end of Marcus Aurelius' rule signaled the end of Pax Romana and Rome's Golden Age. After that time, Rome suffered from ineffective rulers whose poor leadership led to a decline of the Roman Empire. What events followed the Pax Romana? Several events led to the end of the peaceful era known as the Pax Romana. After its end, it was followed by a century of confusion and violence. Roman government grew weak while the army grew strong and independent. The legions of the army fought each other to put new emperors on the throne. Rome had 22 emperors in a period of 50 years. This period of civil war caused great suffering that included food shortages, high prices, decreased support for education, and a decrease in tax revenues. The government tried to fix the economy by making more new coins. Because there were more coins in circulation, however, each of these new coins had less value. The result was that it cost more coins to buy goods. This is called inflation. Inflation happens when prices go up and money is worth less. As a result of inflation, people began to barter. Instead of using money, they traded one product or service for another. As Rome struggled, tribes from other parts of Europe began to attack the empire. The Romans built walls around their cities for protection. The Roman government hired Germanic soldiers for the army, but these soldiers had no loyalty to Rome. In 284 CE, a general named Diocletian became emperor. He tried to strengthen the empire by reforming it, or changing things to make it better. He built forts along the borders. To keep prices from rising more, he set prices for goods and wages. While well-intended, some of Diocletian's reforms led directly to a weakened Roman empire. One reform, for instance, divided the empire into 4 provinces, each with its own "emperor." 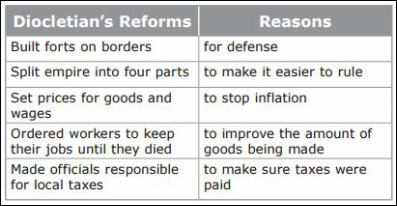 The intent of his reforms was to position authority nearer to the people being governed. What that reform created, however, was a power struggle between the regional emperors. Perhaps even more damaging was the fact that people simply paid no attention to his rules. Diocletian was not strong enough to enforce them, so his reforms did not work. Emperor Constantine from a mosaic in the Hagia Sofia, Istanbul. The next emperor was Constantine. He tried to make Diocletian’s reforms work so the empire would grow strong again. Constantine made the military stronger. Nothing, however, seemed to improve Rome. In 330 CE, Constantine moved the capital of the Empire from Rome to Byzantium in the east. Then he changed the name of the new capital to Constantinople. That name lasted many years. Today the city is known as Istanbul in present-day Turkey. Constantine’s reforms helped the empire, but not enough. After Constantine moved the capital, the Empire grew apart both culturally and economically. Different cultures emerged in what was now, essentially, two separate empires - a western and an eastern one. One of the big differences had to do with changing religious traditions. After Constantine died, Theodosius took power. By 380 CE, Emperor Theodosius declared Christianity the official religion of the Roman Empire. Ruling from Constantinople, Theodosius realized that the Empire had grown too big to rule. When he died, he left a will that instructed the Romans to divide the empire into eastern and western parts. When the Romans divided the empire, they also divided the army. A divided army left the western half of the Empire too weak to stop invaders. In the 300s and 400s CE, many Germanic tribes took over Roman land. Some wanted better land for raising crops and farm animals. Many were running away from the Huns, a fierce group of warriors. A tribe called the Visigoths asked Rome for protection. The Romans let the Visigoths live just inside the Empire's border. Later, the Romans treated the Visigoths badly so the tribe fought back. Under the leadership of Alaric, the Visigoths sacked Rome in 410 CE. Then, another Germanic tribe, the Vandals, invaded the Western Roman Empire. They robbed the Romans, stole their farms, burned buildings, and confiscated valuable things. The Germanic people now had entered every part of Roman society. Many even held high government positions. The last Western Roman emperor was a 14-year old boy name Romulus Augustulus. He did not have strong power or support. In 476, a Germanic general named Odoacer overthrew the emperor. He took control of Rome. No Roman emperor ever again ruled from Rome. Odoacer’s rise to power is considered the end of the Western Roman Empire. The US Capital Building in Washington DC is a tribute to Roman design. Roman ideas still influence our lives in the United States today. We read Roman literature. Modern buildings use Roman arches, domes, and concrete. We share Roman ideas about justice and the law. Like the Romans, we believe that everyone is equal under the law and that a person is considered innocent until proven guilty. We also require judges to decide court cases fairly. Our government, too, is similar to the Roman republic. In a republic, citizens elect their leaders. As in Rome, our republic works best when citizens get involved. The Romans also influenced how we speak. The Italian, French, Spanish, Portuguese, and Romanian languages come from Latin. Many English words have Latin roots. We use the Latin alphabet. Doctors, lawyers, and scientists use Latin phrases in their work. All plant and animal species have Latin names. Some of our architecture and construction comes from the Romans. Government buildings and state capitols often use domes and arches. Concrete, developed by the Romans, is an important building material today. One of the world’s major religions, Christianity, began in the Roman Empire. It spread with the help of the Roman road system. When Constantinople adopted Christianity and when Theodosius made it the official religion of the Empire, they helped spread the new religion.